Note: Pallets cannot actually be stacked on top of one another. 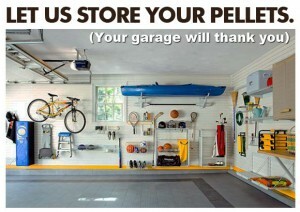 Also, Woodpellets.com cannot guarantee sparkles to appear in pellet-free garages. Call us at 1-800-735-5387 or Order Online! The Not-So-Fine Print: Must order by 5/30. Offer requires payment in full at time of order and must agree to accept delivery between 8/15 & 9/15. Cannot be combined with other offers. Next article What is the Flex Savings Plan?